U-422 was a type VIIC uboat, built at Danzig (Gdansk) and commissioned into the ranks of the Kriegsmarine on 10 February 1943. The boat spent five months training intensively, under the command of Oblt. Wolfgang Poeschel, sailing for her first patrol on 1 August of the same year. Leaving from Bergen, in Norway, U-422 entered the North Atlantic south of Iceland: after almost two months of uneventful patrolling, the uboat was caught on the surface and attacked by an enemy four-engined aircraft - identified as a Halifax, but also a Liberator could be probable. The attack did not damage the vessel, but left three men badly wounded. It was therefore necessary to request medical assistance: a rendezvous was set in the middle of the Atlantic, with U-460. U-460 was a type XIV boat, the so-called milk cows: they were designed to assist and refuel at sea the uboats operating in the North Atlantic, and therefore carried no weapons, but mechanical parts, food, medical equipment and, as said, fuel. The two boats rendezvoused on 4 October, together with other two uboats, U-264 and U-455. The Allied, however, had already implemented very aggressive tactics to intercept these meetings and destroy both operating and refuelling boats. Combining ULTRA interception and aerial coverage, the US Navy created hunter-killer groups, based on a small aircraft carrier, scoring impressive results. 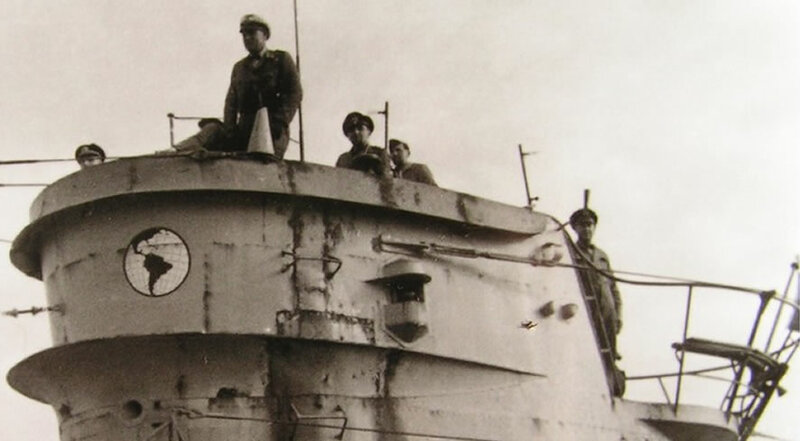 While the three uboats were attached to U-460 to refuel their tanks, they were caught on the surface by Avengers of the USS Card hunting group. Mounting a coordinated and effective defence, the uboats formed a circle so that they were in position to cover each other's dive. U-455 and U-264 managed to dive and escape, the latter taking damage. U-460, bigger and slower to dive, was immediately attacked and destroyed with depth charges by the American aircraft, only two of its 64 crew surviving. U-422 also managed to dive, but was constantly chased and hunted by the enemy. Later in the day the Avenger spotted her again: operating together with strafing Wildcat, the bombers sealed her fate, sinking her with all hands in position 45.13N, 28.58 W.
The hunter-killer tactics had proved effective once more: in one single attack, the US Navy stroke a devastating blow to the Kriegsmarine. U-422 was lost with all hands on its first patrol. U-460, one of only ten preciously needed resupply boat was also sunk, and U-264 was heavily damaged forcing her to return to base. The Uboatwaffe was at mercy of Allied air power, and the tide of the Battle of the Atlantic had inevitably turned.